From 1887 to 1890, Maxwell and Oliver built small dams at Silver Lake and Island Lake, below the Arapahoe Glacier, and filed for rights to the additional runoff these dams captured. The Silver Lake Ditch became the first ditch to rely primarily on a reservoir to store high-water flows for use later in the season. Because the ditch diverts water from so far upstream on Boulder creek, it uses dramatic engineering to keep the ditch high and get the water north of town. At the outset, bringing water along the canyon walls required five wooden flumes, totaling 1300 feet. A 185-foot-long tunnel through Elephant Buttes was created to avoid an even more difficult flume around that buttress of rock. Silver Lake Ditch was laid out to irrigate 1006 acres. One of the first tasks of the ditch in April 1889 was to water 1500 silver maple trees, brought from Missouri and planted along Mapleton Avenue. The Newlands neighborhood was originally on the Silver Lake Ditch, as was most of the part of North Boulder that lies between Silver Lake Ditch and Farmers Ditch. In 1906, Maxwell sold the right to enlarge the capacity of the Silver Lake and Island Lake reservoirs to the City of Boulder for $46,000. He reserved the amount of water that the reservoirs originally held as storage rights for the Silver Lake Ditch. In 1907, Maxwell sold the ditch, with those storage rights as well as direct flow rights, to W. W. Degge for $25,000. Degge intended to use the Silver Lake Ditch, Wonderland Lake and Mesa Reservoir as part of a larger project of suburban development, called Wellington Gardens. Degge was ahead of his time by about 70 years, and his vigorous promotions came to naught. The Silver Lake Ditch stayed in the family as a for-profit company, passed down from father to son to grandson. By 1947, under Degge family management, the Silver Lake Ditch had fallen into such disrepair that very little water was getting to users. The users organized under the leadership of Everett Long, owner of Long’s Iris Gardens. He negotiated with Degge to sell the ditch to the users for $10,000. The Ditch reorganized as the Silver Lake Ditch Water Users Association. 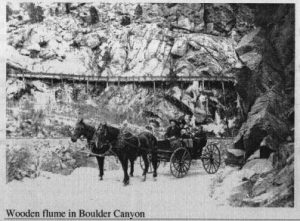 Over the next seven years, under Everett Long’s stewardship, the new owners replaced the original old wooden flumes by digging and blasting open channels and hanging the steel pipe that currently conveys ditch water along the sides of the cliffs in Boulder Canyon. Since that time, some sections of the pipe have been replaced. 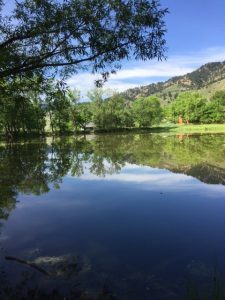 The City of Boulder and the Silver Lake Ditch have entered into agreements (1906, 1955, 1965 and 2009) that affect present-day users. These agreements state that the ditch water is tied to specific property and cannot be sold to someone else in a different location. Abandonment of water, storage rights, procedures for leasing water, and reporting requirements are set forth in these agreements.